Note: to avoid first day long drive to Valparai through forest road, overnight stay in Athirappally is suggestable. The Athirappilly Falls is situated 1000 ft above sea level on the Chalakudy river, at the entrance to the Sholayar ranges of the Western Ghats, Athirappalli is a scenic combination of forests and little streams. Falling from a height of 80 feet, this is one of the largest waterfalls in the state. The drive Valparai from Athirappalli passes through the Wildlife Sanctuary noted for elephants, boars, lion-tailed macaques, gaur, spotted deer, sambar, and giant squirrels. The area is also rich in birds, including the great hornbill. Valparai is a mid-elevation hill station. The tea plantations are surrounded by evergreen forest. The region is also a rich elephant tract and is known to have many leopards. The Valparai range is also habitat to the Nilgiri tahr, an endemic wild goat. These mountain goats inhabit the high ranges and prefer open terrain, cliffs and grass-covered hills, a habitat largely confined to altitudes from 1200 to 2600m in the southern Western Ghats. Topslip is located at 800 feet (240 m) above sea level on the Anamalai mountain range. It is popularly known as Anamalai Hills. It is a small place in Anaimalai Tiger Reserve and Wildlife Sanctuary. The Park is contiguous to the Parambikulam Wildlife Sanctuary to its west and to the Eravikulam National Park and Chinnar Wild life sanctuary. The Anamalais rise from foothills at the height of 300 m to Topslip-Parambikulam Plateau at 800m and to the Valparai Plateau, between 1000 and 1250 m. The elevation range includes an array of habitats ranging from dry thorn forests in the low foothills to semi-evergreen stretches to grass hills and evergreen shoals in Valparai. The sanctuary supports extremely diverse faunal population and several species are exclusive to this area. A wide variety of herbivores inhabit this Sanctuary including elephant, gaur, Sambar, spotted deer, barking deer, mouse deer, nilgiri tahr and wild boar. This is equally matched by carnivore diversity with Tiger, Leopard, Wild Dog (Dhole), Indian Fox, Leopard-cat and Jungle cat. Primates are represented by bonnet macaque, common langur, nilgiri langur, lion-tailed macaque and slender loris. Other important mammals include the Sloth Bear, Small Indian civet, Toddy cat, Ruddy mongoose, Stripped-necked mongoose, Common Otter, Smooth Indian Otter, Nilgiri marten, Indian Flying fox squirrel, Indian Giant Squirrel, Dusky stripped squirrel, Flying squirrel, Black naped Indian Hare, Bandicoot Rat, Grey musk shrew, Indian Porcupine, Indian Pangolin. 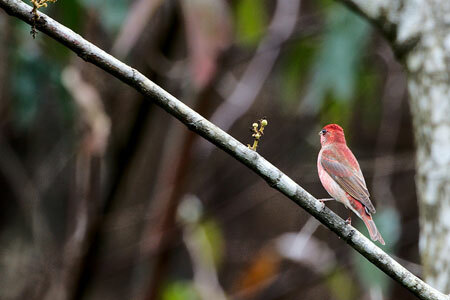 The Sanctuary is a birders’ paradise. Over 300 species of birds have been sighted. Apart from the Great Pied Hornbil-the flagship species, rare birds like the Frogmouth, Red-winged crested cuckoo are found here. 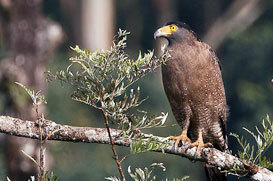 Birds of prey like Crested Serpent Eagle, Spot-billied Eagle , Black Eagle, Crested Gohawk, Rufous bellied Eagle, Jerdon’s Baza, Mountain Hawk Eagle, Peregrine Falcon, Owl. Grey Jungle fowl, Painted Bush quail, Red Spurfowl, Malabar Pied Hornbill, Malabar Grey Hornbill, White-bellied Woodpecker, Alpine Swift, Brown-backed Needletail, Mountain Imperial Pigeon, Nilgiri Wood Pigeon, Dollar bird, Malabar Trogon, Asian Fairy Bluebird, Blue-bearded Bee eater, White bellied Treepie, White-bellied Shortwing, Wynad Laughingthrush, Hill Myna, Nilgir Flycatcher. Many species of flycatchers, Drongos, Treepies, Birds of prey, Thrushes, Warblers, Babblers, woodpeckers, Parakeets, Pigeons, Shrikes, Cuckoos, Swifts and Owls are also found here. 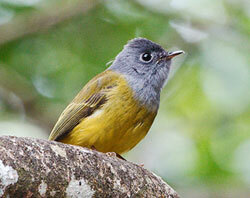 Shortwing, Wynad Laughingthrush, Hill Myna, Nilgir Flycatcher. Many species of flycatchers, Drongos, Treepies, Birds of prey, Thrushes, Warblers, Babblers, woodpeckers, Parakeets, Pigeons, Shrikes, Cuckoos, Swifts and Owls are also found here. The Sanctuary is a treasure house of several rare, endangered and endemic species of reptiles and amphibians. Rare reptiles like Travancore Cane turtle and Travancore tortoise,Marsh Crocodile,Common Indian monitor,Kerala Forest Terapin. Travancore Cane turtle, Forest calotes snake, Sand snake, Olive keel back, Water snake, Bronze bark tree snake, Perrotes shield tail snake, Common wolf snake and Green keel back are present here. Southern Green calotes, Common skink ,Snake skink,Draco or Flying lizard. Apart from this, several species of snakes including the poisonous King Cobra, Cobra, Common Krait, Saw-scaled viper, Russels viper, Bamboo Pit Viper, and non Poisonus Indian rock python, Green keelback, Vine snake, Common warm snake, Sand snake, Olive keel back, Water snake, Bronze bark tree snake, Perrotes shield tail snake, Common wolf snake and Green keel back are present here. The amphibians include narrow mouthed frogs like the Microhyla, tree frogs like the Malabar gliding frog, Green tree frog and toads like the Bufo beddomi, Bufo melanostictus.The insect diversity is amply demonstrated by a wide variety of butterflies and moths found here.It is very rich in grasshoppers, mantises, beetles, flies, ants, termites and spiders (arachinids), which play an important role in eco system sustenance. At about 20 Kms from Topslip, Parmabikulam Wildlife Sanctuary at height of about 300 meters extending up to 800meters.This Valley would be the literal and graphical representation of the phrase ‘Heaven on Earth’. The sanctuary has a rich diversity of animal life including: Mammals 39 species, Amphibians 16 sp., Birds 268 sp., Reptiles 61 sp., Fish 47 sp., Insects 1049 sp. and Butterflies 124 sp. This sanctuary is also referred to as the "state capital for the massive gaur" by wildlife experts. Mammals: Important mammals include: lion-tailed macaques, Nilgiri tahr, elephants, Bengal tigers, Indian leopards, wild boar, sambar, bonnet macaques, Nilgiri langurs, sloth bears, Nilgiri marten small Travancore flying squirrel and gaur. Reptiles: Reptiles of very high importance in Parambikulam Wildlife Sanctuary include: king cobra, Kerala sheildtail, Travancore kukri snake, Travancore wolf snake, Cochin cane turtle, Travancore tortoise, Indian day gecko and Western Ghats flying lizard. Other important reptiles are Indian rock python, Malabar pit viper, Travancore tortoise, South Indian forest ground gecko, South Indian rock lizard, mountain skink[disambiguation needed], mugger crocodile, varanus, pond terapin, chameleon and the snakes spectacled cobra, krait, green keelback, olivaceous keelback, western rat snake and vine snake. Fish: 47 species of fish are recorded in the Sanctuary of which seven species are listed as endangered and 17 are endemic to Western Ghats. Butterflies: There are 124 species of butterflies recorded in the sanctuary of which 34 are rare and endemic. Arrival at Chinnar Wildlife Sanctuary. Check into Chinnar Forest Department Accomodation ( Basic Accomodation Only). Chinnar Wildlife Sanctuary is a unique protected area located in the rain shadow region in the eastern slope of Western Ghats. The area is diverse in eco systems and rich in ethnic cultural heritage. It is a well known repository of medicinal plants. The sanctuary is home to Bonnet Macaque, Hanuman Langur, Nilgiri Langur and Slender Loris. Apart from the Rare Rusty Spotted Cat and Nilgiri tahr, the important mammals found in the Sanctuary are Elephant, Tiger, Leopard, Gaur, Wild Boar, Sambar, Spotted Deer, Barking Deer, Porcupine, Wild Dog, Common Langur, Bonnet Macaque, Jackal, Sloth Bear, Nilgiri Langur, Jungle Cat etc. The Chinnar plains have groups of Gaur, Spotted Deer and Sambar. Tigers are present but their home ranges extend to the neighbouring forests. Leopards are common. There is marked seasonality in the movement of Elephants and Gaur. The legendry white bison has been sighted in the Chinnar plains. Chinnar Wildlife Sanctuary has the only population of Grizzled Giant Squirrel in Kerala. The sanctuary is also home to Malabar Giant Squirrel as well as Common Flying Squirrel. Post breakfast trekking through Chinnar Wildlife Sanctuary with naturalist (03 hrs trek). Afternoon proceed to Munnar. Overnight stay at Eco Tones. Breakfast at the resort / Visit Munnar including Aranya Natural. 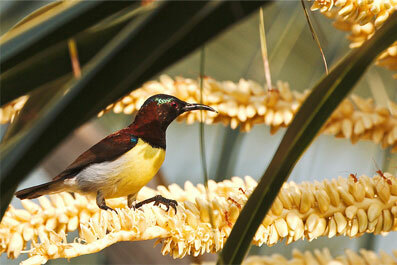 The Thattekkad Bird Sanctuary, covering an area of barely 25 km2, itwas the first bird sanctuary in Kerala. 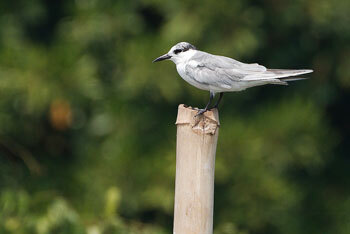 Salim Ali, one of the best knownornithologist described this sanctuary as the richest bird habitat on peninsular India. Thattekkad literally means flat forest, and the region is an evergreen low-land forest located between the branches of Periyar River, the longest river in Kerala. Thattekkad (Salim Ali's) Bird sanctuary (7 km from Hornbill Camp) is the home for 270 species of birds including the migratory ones. 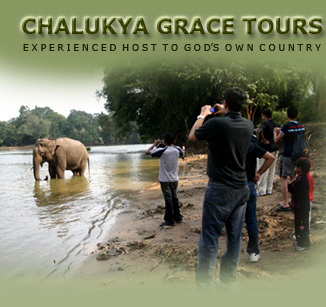 The sanctuary is spread over an area of 25 square kilometers and is located between the tributaries of the Periyar River. The fascinating birds that are found here are Blue Bearded Bee-eater, Malabar Trogon, Grey Jungle Fowl, Black Winged Kite, Brown Shrike, Crimson-fronted Barbet, Ceylon Frogmouth, Small Sunbird, Night Heron, Blue winged parakeet, White-bellied Tree pie, Indian Roller, Malabar Grey Hornbill, etc. The thick tropical deciduous and evergreen cover is a safe haven for these winged creatures. The fascinating birds that are found here are Blue Bearded Bee-eater, Malabar Trogon, Grey Jungle Fowl, Black Winged Kite, Brown Shrike, Crimson-fronted Barbet, Ceylon Frogmouth, Small Sunbird, Night Heron, Blue winged parakeet, White-bellied Tree pie, Indian Roller, Malabar Grey Hornbill, etc. The thick tropical deciduous and evergreen cover is a safe haven for these winged creatures. Overnight stay at Hornbill Camp. After breakfast drive to Alleppey. Check in at Our Land Resort and step into ultimate tranquility. Our Land is an island resort south of Alappuzha in Kuttanad, also known as the 'rice bowl of Kerala' due to its wealth of paddy crops, one of the few places in the world where farming is done below sea level. Well known for its avian population, the resort offers a range of bird watching spots for avid bird lovers, and hundreds of birds can be found perching in the trees on the island - the place hosts more than 105 species of birds. Overnight stay at Our Land Resort. Our island retreat is one of the few densely vegetated areas surrounded by miles of paddy fields. It has become a sanctuary for birds and bird watching is one of the pastimes that you are bound to enjoy during your stay with us. You will find more than 106 species of birds including several varieties of migratory birds that frequent our island and the surrounding waters during the winter season. These include Siberian cranes, parrots, teal, larks, flycatchers, and others. 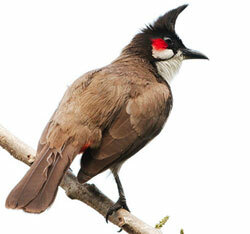 Other indigenous birds like the waterfowl, cuckoo, owls, egrets, herons and ducks can also be spotted. As you walk on the island pathways or sail on the backwaters just before sunrise or sunset, you can find hundreds of birds perched on the trees on the island. Binoculars and a few bird identification guides are available at the retreat. Board the houseboat & sail through the backwaters of Kuttanad – The avifauna of Kuttanad was studied from January 1995 to June 2007. 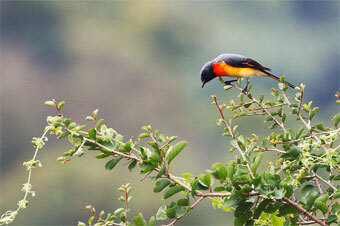 Two-hundred-and-twenty-five taxa of birds belonging to 15 orders and 59 families were recorded. Among the birds recorded, 38% were migrants. Fifty-five species were found to breed in the area. Family Scolopaceidae showed maximum species diversity. 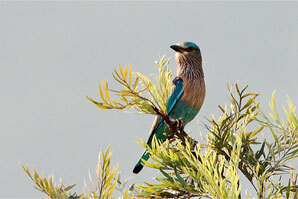 European Roller Coracias garrulus recorded during this study is the first report of this species from Kerala. Ten globally threatened species were recorded. Kuttanad wetland shows greater species diversity, especially in the wetland birds. Disembark the houseboat after breakfast; proceed to Kochi via coastal road. After check in hotel Raintree After noon sightseeing tour of Older parts of Fort Cochin. And evening sunset cruise. Mangalavanam is an ecologically sensitive area situated at the centre of th Kochi. 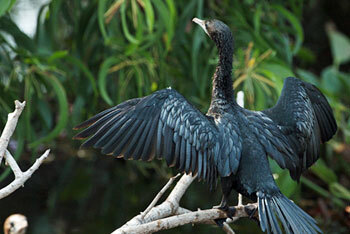 It is a nesting ground for a large variety of migratory birds and supports many types of mangroves. The Managalavanam is often regarded as the "green lung of Kochi", considering its role in keeping the city's air pollution under check. 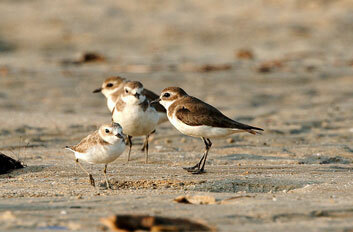 The area is a roosting place for many kinds of resident and migratory birds. The true mangrove and mangrove associate species that exist in the sanctuary are Avicennia officinalis, Rhizophora mucronata, Acanthus ilicifolius and Acrostichum aureum—the species of conservation importance. Of the recorded species Acanthus ilicifolius is considered to beEndangered and Rhizophora mucranata as Vulnerable according to IUCN. On time transfer to Cochin International Airport. Departure.